​Buffalo NY Newborn Family Photographer. Portrait Pretty Photography specializes in fresh and modern maternity, newborn, baby, child, senior and family photography. Our studio is in the Southtowns of Western New York just outside of the city of Buffalo. Our sessions are relaxed and fun. If you're ready to experience the difference, contact us today to schedule your session, We'd love to work with you! This beautiful newborn baby girl was photographed in my Buffalo NY Newborn Portrait Studio using soft pastel tones and neutrals. She was soooooo good. A dream baby. This fresh new baby girl was such a dream to work with. (If you are a newborn photographer you know what I am talking about) Momma followed my newborn prep guide to a T. That makes the newborn session go so much smoother. 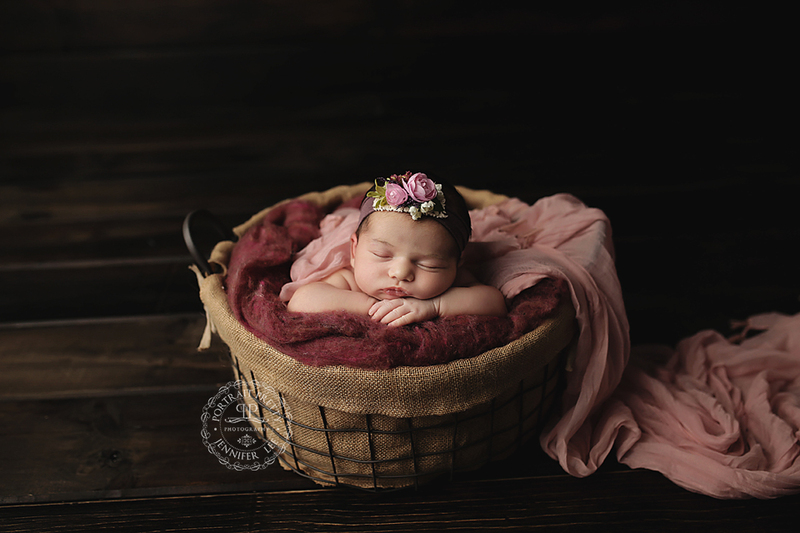 While prepping for this session Momma decided to go with cream, rose pink along with some deep rich tones for the prop shots and parent with newborn portraits. One of Momma’s favorites was this handmade Mia Joy Newborn outfit. Momma just loved the pearls beading up her back. This is one of my all time favorite vendors. Everything she makes is made with so much detail and to perfection. I go to her for all most all my newborn and sitter outfits. Mom loves the bling so we added this beautiful crystal headpiece and to top if off added some angel wings as well. So beautiful. This prop shot is done on a handmade wood backdrop that I put together last year. I like to change things up every year but this one is always a favorite so I decided to keep it around. The deep rich tones go well with any color. This little sweetheart’s dark hair pops even more with this background. A must have shot for Momma. The all time favorite to a lot of Mom’s the infamous newborn froggie pose. Even though this beautiful baby was a dream to work with, I struggled with getting her tiny fingers out of a tight grip. After trying and trying I decided to take the shots anyways just in case she would not allow me to bring those fingers out. I was right, was not going to happen. Looks way too adorable anyways. I never force anything on a newborn. Patience is key for sure. I hear all the time, how are you so patient? Well, it’s just how I have always been. Which is why this profession is perfect for me. Jennifer Lee is a Buffalo NY Newborn Photographer serving all of WNY in her commercial retail studio space. The studio is centrally located in Buffalo, NY from all directions and is by appointment only. Book your session today.